Today I’d like to talk about Ferns and how now is the perfect time in the Northwest to prune those lovelies. The fiddleheads (new shoots) are finally willing to unfurl and delight us with their grace. So quick, prune the old fronds down to the base before the new shoots grow up and confuse things. Don’t despair if you can’t get to them, the old fronds can still be cut back later in the season but it’s much easier to do it now before the new fronds grow among the existing. 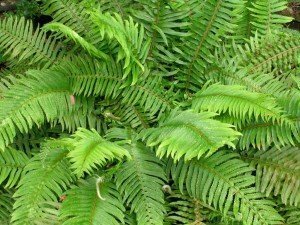 The plant will look a little bare for a short while but once the new fronds begin unfurling their lush, green delight you’ll be glad you pruned them when you did. What to do with the old fronds? Well, you can put them in your yard waste bin, add them to your own compost pile or lay them on the ground as mulch. They add a nice texture to the side of a path or a garden bed and as they decompose they will add wonderful nutrients to the soil. It’s December, what can I do in the garden?